While fighting games have made a resurgence as of late, there are still some of them that have been laid along the wayside. The fighting game genre has been experiencing a revitalization of popularity as of late. Ever since Street Fighter IV exploded into the scene in 2008, almost a decade ago, there seems to be a steady flow of pugilistic video games that have come out of the woodwork. Some old franchises like Mortal Kombat and Killer Instinct have been resurrected on modern systems. There are even some new challengers like Skullgirls and BlazBlue have come along to try to compete for the fans’ fight money. In fact, some classic fighters, like Darkstalkers and Marvel vs. Capcom: Origins, have been given the HD treatment in an attempt to tug at our nostalgic heartstrings. Yet, even with fighting games becoming popular once again, there are some really good fighting games that have sadly been forgotten in the shuffle. These are the fighting games that, while they were extremely popular in their time, have failed to make a comeback. Here are just five of these fantastic fighters that fans have forgotten. When Street Fighter II became a huge success, a lot of companies tried to capitalize on its success by making their own fighting game. And none of those companies went as whole hog on fighting games like SNK. They published a ton of fighters on their fabled Neo Geo system. While a lot of them, like Fatal Fury, Samurai Shodown and The King of Fighters, are incredibly well loved by fans, there were others, like World Heroes, that weren’t so highly regarded. 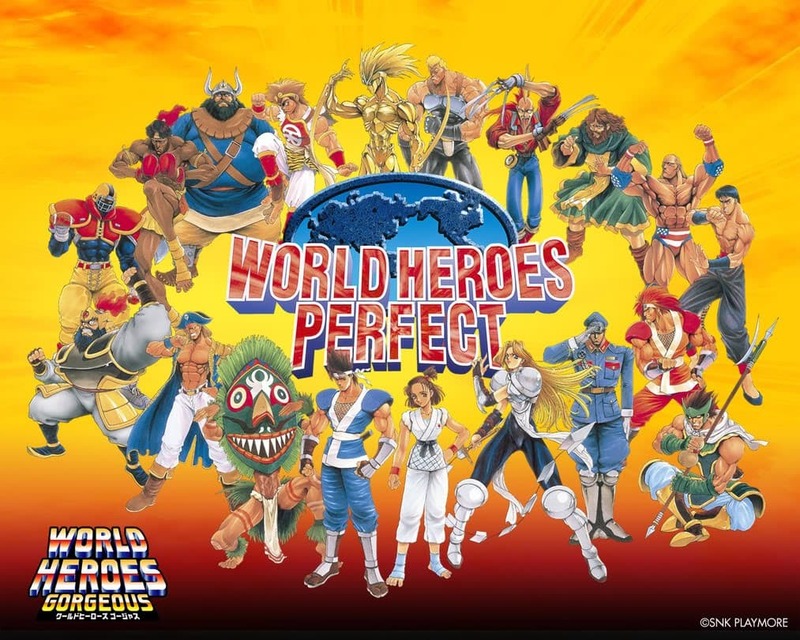 The first World Heroes was a blatant ripoff of Street Fighter II, with a roster and special attacks that was almost an exact copy of Capcom’s breakout game’s list of characters and attacks. Thankfully, ADK did add more unique characters in subsequent entries, such as Mudman in World Heroes 2, as well as slowly upgrade the controls and systems to make it much more fun to play. By the time the third iteration of the series came out, the aptly named World Heroes Perfect, the gameplay was snappy enough to contend with Capcom’s Super Street Fighter II Turbo. Nintendo fans actually can play World Heroes Perfect on the Switch. Still, where’s the sequel, SNK? While most fighting games on this list at least one sequel, Primal Rage didn’t. Despite being released on virtually every console available at the time (yes, even the Game Boy got a port), Primal Rage failed to get a solid fanbase. Sad, really, because this game is one of the more outrageous fighters out there. It may be easy to mistake Primal Rage as another Mortal Kombat wannabe because of its digitized graphics and gory fatalities. But the game had a charm that made it its own thing. For one, you don’t control any human characters; you control giant monsters instead. Who wouldn’t want that, right? Primal Rage may seem dated with its awkward control scheme and rather shallow gameplay by today’s standards. Even the digitized graphics, while still fine in their own right, look rather antiquated today. But, like what NetherRealm Studios did with the Mortal Kombat reboot, Primal Rage can get a huge upgrade with the graphics and combat system to make it on par with today’s fighters. Sega’s Virtua Fighter was the first 3D fighter ever made and it was visually impressive for its time. However, Battle Arena Toshinden added a really basic move to make it the first “true 3D” fighting game: the sidestep. It’s hard to imagine that, before Takara’s weapon based fighter, most fighting games actually forgot all about the 3rd dimension. Battle Arena Toshinden was considered to be a really innovative fighter for the time, mainly because of the introduction of the sidestep mechanic. Unfortunately, Tamsoft failed to add any new innovations to the series and, eventually, games like Tekken and Soul Caliber refined 3D fighting mechanics to an extremely deep level and Toshinden failed to keep up. It’s true that the game hasn’t aged all that well and feels really slow by today’s standards. But it’s still sad that the original OG of sidestepping in fighting games isn’t all that remembered anymore. At first glance, the Bloody Roar series looks like a gimmicky fighter, where the gimmick is that your character can turn into some kind of anthropomorphic creature. But that would be selling the series short as the ability to turn into a beast adds a different element that makes it a little more than your average fighting game. It certainly didn’t hurt that the action was really good and the controls were incredibly responsive. The main criticism that I’ve always seen thrust upon Hudson Soft’s 3D fighter is how simplistic it plays. With only two regular attack buttons and a button to turn your characters into Beast Mode. This may make it seem the games lack depth and, to a certain degree, it’s an apt notion. However, these simplistic controls were also one of the reasons why it was so fun and easy for anyone to just pick up and play. The Bloody Roar series is one franchise that didn’t try to fix something that wasn’t broken. Still, it would be kind of nice to see if the current holder of the Bloody Roar license makes a new game… wait, wasn’t Hudson Soft bought by Konami? On second thought..
A lot of fighting games have come and come. But if there’s one specific fighting game franchise I feel that never truly got the respect that it deserves, it would be Rival Schools and its sequel, Project Justice. The series had a great cast of unique and rather oddball characters. The fighting was always fast, crazy and, most importantly, responsive. The games looked really good for their times. And, the weirdest thing about them, they actually had really good stories. Not Mortal Kombat or Injustice level good. But they were really fascinating stories and they would change depending on which characters you would pick. Also, it’s hilarious to see all of the strange and inventive team up attacks in the game. The best part about Rival Schools and Project Justice are definitely how crazy the fighting can get. There’s an extreme amount of depth to the proceedings, which makes it as good as the current fighters that are out there. You can do double team attacks with your partners and, in Project Justice, even triple team moves that does severe damage to your opponents. It was definitely one of my favorite fighting games growing up and I’m sad that not many people have heard of the series. The games are incredibly cool and fun and yet Capcom let the series fall into a level of obscurity that only real fighting game fans will remember it? Why, Capcom? Why? As much as I love Power Stone, it’s hard for me to really say that it’s a fighting game in the purest sense. Sure, you’re still beating up against an opponent using punches and kicks. But there aren’t any real special attacks until you manage to collect all the Power Stones in the stage, and even then, all you’re doing is still pressing the punch and kick buttons to attack. However, I will say that the games are incredibly fun, especially Power Stone 2. The second game introduced 4-player battles and more interactive items on each stage. While I can’t really say it’s a fighting game, it still sad that many people don’t know about the series anymore.